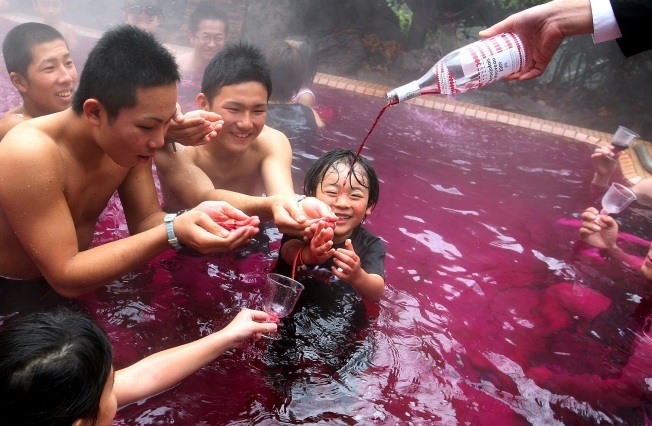 A sommelier pours a bottle of 2009 Beaujolais Nouveau to an open air wine spa in Japan. Fueled by major marketing efforts on the part of wine producers, starting today New York will celebrate the arrival of a new Beaujolais Nouveau vintage, with themed boozing parties and myriad tasting opportunities. Beaujolais Nouveau, a young, simple, vulgar wine by oenophile standards, has itself a place in the hearts of New Yorkers thanks to its gentle price point, drinkability and versatility. Always released on the third Thursday of November, it is light and with very little tannin on account of its time aging--usually just a few weeks. Those with any regard whatsoever for what the Appellation d’origine contrôlée says about its origins will have no need to read on. ¶Embracing America's embrace of Beaugolais, Georges DuBœuf-- the so-called King of Beaujolais, who has declared 2009 the best vintage in 50 years--is hosting a somewhat bazaar Woodstock-themed food drive and tasting during which a "Peace, Love, and Beaujolais Nouveau" vintage Volkswagen escorted by "biker chefs" and "wine-loving hippies" will deliver its first cases for an uncorking ceremony at Bagatelle tonight. It might be worth stopping by just to see what the hell a Beaujolais Biker Chef looks like. ¶Also tonight, at the the French Institute, FI:AF, the tradition of Le Nouveau est Arrivé! is being celebrated with tastings of the most recent vintage from different winemakers in the region, and of course, there will also be pâtés, cheeses and charcuterie. ¶For those drinking at home--alone or otherwise--Whole Foods will launch this year's version of the seasonal Georges DuBœuf with an exclusive label. It will also feature Persillé du Beaujolais, a soft blue cow's milk cheese produced by a small, artisanal dairy in the Rhone Alps. ¶If you can wait until Monday, the Ordre des Compagnons du Beaujolais New York, a French organization that promotes Beaujolais wines, will host its annual Nouveau dinner at Capsouto Frères. A cocktail reception to whet your palate will be followed by four courses, each paired with a different Beaujolais.